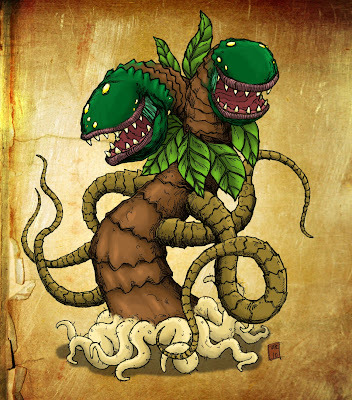 A towering, carnivorous predator plant, the Bicheplanus Repugnai is known to prey on any animal that gets within reach of it's grasping tendrils. Although it remains stationary most of the time, a limited amount of locomotion has been observed, with the root-like tendrils used as "feet." Specimens in the wild of over 20 meters or more have been documented.